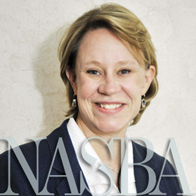 We continue our series on NASBA’s committees with a look at the Education Committee. The Education Committee oversees the entry-level education requirements to the accounting profession, including effective implementation of UAA Rules 5-1 & 5-2 across the 55 jurisdictions. The Committee also encourages collaboration between the education community and accounting profession to proactively address issues relative to college curriculum and the jurisdictions’ individual education rules. Alfonzo Alexander, NASBA’s Chief Relationship Officer and Committee staff liaison, said the Education Committee is important to NASBA because it is responsible for keeping the pulse on what’s going on in the academic community as it relates to preparing individuals to be accountants. “As states look at different changes to their education requirements, or as academic institutions make changes to their curriculums, it’s important for the Education Committee to be the conduit that gets that information back to NASBA, in addition to serving as the liaison that shares such information with the relevant state boards,” said Alexander. Another important focus of the Committee is administering NASBA’s Accounting Education Research Grants Program, which seeks to advance research on educational issues impacting certified public accountants (CPA), the public accounting profession and state boards’ charge to protect the public. Launched in 2011, the program funds and awards grants annually totaling up to $25,000 for one-year, research projects, with a maximum of three research grants awarded per year. Research projects in areas helping NASBA and the Boards of Accountancy protect the public and be better resources to the public accounting profession are given preference. Education Committee leadership also holds meetings to discuss Uniform CPA Examination candidate statistics collected in The NASBA Report on the CPA Exam, and how the information made available in this useful publication can help support academic institutions. The Committee strives to be an information resource for educators in the accounting profession. Committee representatives will remain busy throughout the year attending meetings to further the relationships with organizations in the academic community. Some of the meetings attended by Committee members include the annual meetings of the American Accounting Association (AAA), Federation of Schools of Accountancy (FSA) and Accounting Program Leadership Group (APLG). One of the Committee’s specific initiatives for this year is to enhance relations with the AAA. James Suh, NASBA’s Director of Continuous Improvement and Analytics and Committee staff liaison, said the relationship with the AAA is important to the Committee because educators and accounting programs contribute greatly to the readiness of CPAs entering the market, and increasing the collaboration and knowledge sharing with the AAA can only help to further enhance the quality of education that the students receive. To see a list of participating NASBA volunteers on the Education Committee, please visit the Education Committee page in the Committees section of this website.